Just spending peanuts and getting to hire the best Social Media Marketing Agency in Chandigarh can make a lot of difference. Business recognition, traffic and finally sales, this is what you get in return. 90% of our clients claimed that they got a lot of recognition and exposure. The conversions might not be immediate. You will certainly feel an increase in calls and footfall. Social media marketing has become the most viable and cost-effective means to advertise. When you try to hire a social media marketer in the house, you fail since the budgets are restricted. You cannot hire an expert with a limited budget. Digital marketing requires teamwork. No one can master all tools. It is not viable to hire an expert for one project. Therefore you must prefer to hire an agency that is best Social Media Marketing Agency in Chandigarh. If you want to reach a maximum number of people then social media marketing is for you. It surely increases brand recognition. While you update your social media accounts regularly, you knock the customers. To get a good response initially, we recommend maximum shares and shout out loud strategy. Once people like or share your post, your followers increase. Each person who views your post becomes your potential customer. Social media marketing is a way to drive traffic to your website. A website today is virtually your store. Even a customer who is willing to come to your store will visit your website first. Some people do not have any virtual stores. They just sell online. While some may just be middlemen. Look at Uber. It is just an application while it has no physical existence. If you do not have a social media marketing strategy then only people who know your website will visit it. If you have a social media page then people will surely visit your website to view your services. Every social media page is a gateway to your website. Social media is a pool of variety of people. You may reach out to a large audience simply by social media marketing in Chandigarh. Experts in digital marketer have assured that a regular social media update assures better search ranking. Search engine optimization is very important for conversions. Social media does not help in conversions but certainly helps in driving traffic. Social media marketing is a tedious and time-consuming process. It may take some time to produce results but surely it will. Search engine optimization is quite important, as people who searched for the particular service do not go beyond the first page. His demand is quenched there itself. People start connecting with people whom they see usually. When you share a video, post or receive comments then people start connecting with you. Research has proved that people Social media marketing is like a relationship with your customer. When the customer is impressed, he is likely to recall you when he needs your services. 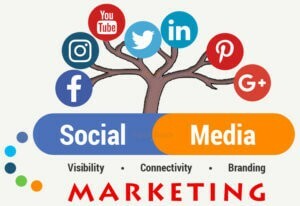 Social media marketing helps to connect better. You can solve all queries, doubts or chat with your customer. He feels that he is connected 24×7. Basically, it is a communication platform. When the customer receives attention, he feels satisfied. Social media marketing is an opportunity to show your work. It is like communicating with a group. At the same time responding and catering to each query personally. Customer satisfaction and brand loyalty go hand in hand. When you stay connected with the client, your image improves. Customers see social media marketing as a communication channel. People are very loyal to brands. You can grab the attention of the customers. When you are working with the best Social Media Marketing Agency In Chandigarh then you need not worry about the cost. If so many people are associated with them then they must be economical. The best Social Media Marketing Agency In Chandigarh knows well what to do and when. The expertise they have ensures great returns.